Halloween is almost here. 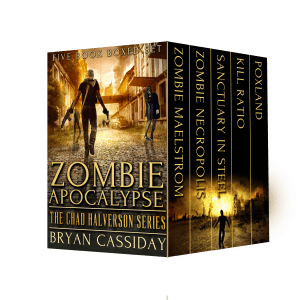 This is the perfect time of the year to buy a zombie boxed set–like Zombie Apocalypse: The Chad Halverson Series available on Kindle. T S Elliot had it wrong. This is the way the world ends . . . not with a whimper but a bang as gangs of bloodthirsty zombies run amok, decimating humanity. For a limited time only, Zombie Boxed Set #1 is only 99 cents today on Kindle. 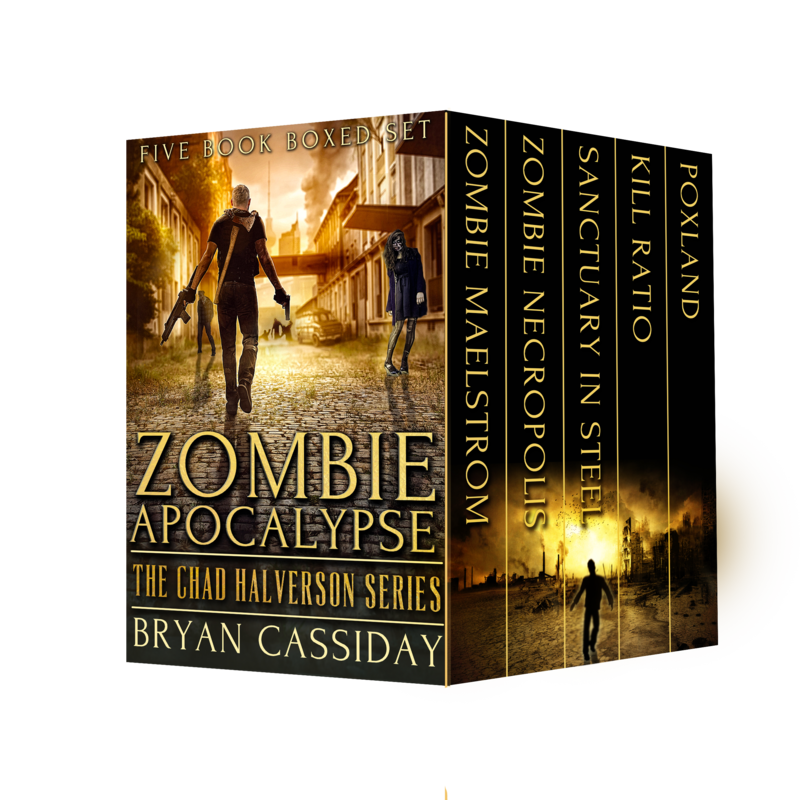 This special boxed set includes the first two books in Bryan Cassiday’s Chad Halverson zombie apocalypse series, Zombie Maelstrom and Zombie Necropolis, respectively. Each book is complete and unabridged. Join black-ops CIA agent Chad Halverson as he touches down at LAX Airport in a city besieged by disease-ridden flesh-eating zombies. How many in his party will survive the zombie onslaught? How many will survive each other as they battle among themselves? Find out the shocking answers in Bryan Cassiday’s Zombie Boxed Set #1. 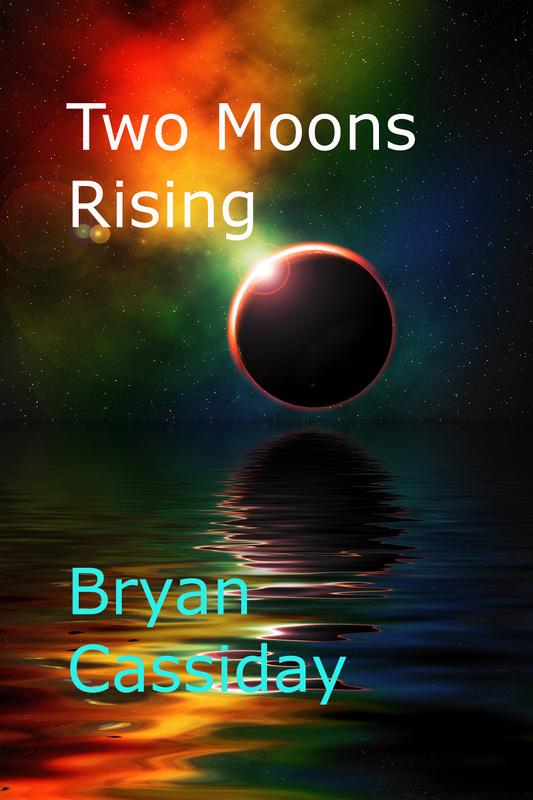 Bryan Cassiday’s new apocalyptic novel Two Moons Rising is now available for preorder at Amazon. 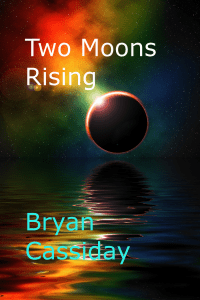 Bryan Cassiday’s new apocalyptic novel Two Moons Rising will be published in April. Police investigate the murders of thirteen-year-old Lucinda Pugh’s parents who died in their beds after somebody soaked them in gasoline and set their house on fire in their hometown of Santa Loma, California. All evidence points to Lucinda as the emotionally ill culprit, despite lack of motivation on her part. When an exorcist attempts to exorcise her, Lucinda reveals that an alien invasion of Earth is imminent and her parents’ murders are just the beginning of a full-fledged assault. As if on cue, a second moon, this one bloodred, appears in the sky, ushering in a tsunami and other untoward weather to Santa Loma, followed by a series of unspeakable murders that rock the town–murders committed by children. Jake Caulfield, a local reporter desperate for a story that will launch his career, must find out if this is the end, and on the way he discovers somebody else’s life is more important than his own. I am now working on an apocalyptic horror novel for this year. As of right now, I’m not sure of the exact date of its release. It will chronicle the effects of an alien invasion on a small town in Southern California. The aliens claim to know the truth about the origins of mankind and they want to tell humanity. The problem is, humanity doesn’t want to hear it. The other problem is, the aliens want to take over planet Earth and subjugate man to their will. Some humans join up with the aliens in their conquest of earth after the aliens promise them power over their fellow man. Not all humans want to join the aliens, however–which means the bloody battle for Earth is on. Dear readers, I appreciate your support for my tales. So much so I want you to win a Kindle or a Kobo ereader or a gift card. All you have to do to enter is to post a ‘selfie’ or photo of yourself holding your favorite of my books to www.horrorselfies.com; and then encourage your friends to comment on the photo. When your photo appears you are provided with a page you can share on major social networks at the click of a button. If you are already on horrorselfies.com don’t worry, you’re allowed multiple entries. Good luck! I’d really appreciate your support on this as soon as you read this email. 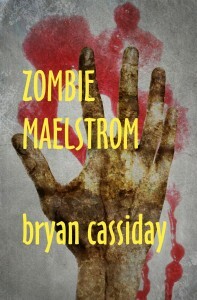 Now through Halloween Zombie Maelstrom will be available for only 99 cents on Kindle. Happy Halloween!! !